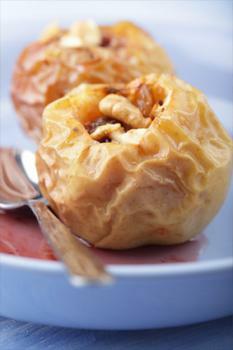 Baked apples make a tasty side dish or dessert. They are especially delicious in the fall when apples are in season. While you can use any variety of apple to make these recipes, they are especially good with a sweet-tart apple, such as a Honeycrisp, Pink Lady, or Braeburn. This is a simple baked apple that is a good side dish for pork, or a delicious dessert. For dessert, try serving it with a bit of whipped cream or vanilla ice cream. The recipe serves four. Slice the top off the apples and use a spoon to dig out the core, leaving the bottom of the apple intact. Place the apples in a baking pan. In a small bowl, mix the brown sugar, cinnamon, salt, and maple syrup. Divide the mixture among the four apples, putting it in the hole where the core was. Cut the butter into small pieces and dot it along the top of the apples, making sure to put one or two pieces of the butter over the filling. Bake in the preheated oven until the apples are tender, about 15 minutes. These apples are stuffed with golden raisins and nuts, making them a delicious dessert, especially when topped with whipped cream. The recipe serves four. Cut the tops off the apples. Using a spoon, scoop out the apples' cores, leaving the bottom intact. Scoop out additional space, making a pocket about 1 inch in diameter in the center of the apple. Place the apples in a baking pan. In a small bowl, mix the brown sugar, golden raisins, chopped pecans, orange zest, ground ginger, cinnamon, and melted butter. Spoon the mixture into the cavities you made in the apples. Bake in the preheated oven until the apples are tender, about 20 minutes. 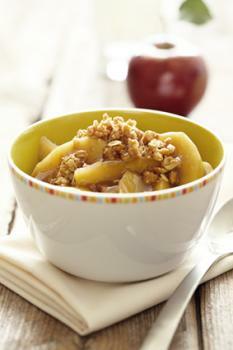 These apples have a really easy crumble topping made from breadcrumbs. The recipe serves four to six. In a large bowl, mix the apples, lemon juice, lemon zest, sugar, nutmeg, and salt. Pour the mixture into a 9-inch square baking pan. In a small bowl, mix the breadcrumbs, butter, brown sugar, and cinnamon. Bake in the preheated oven until the topping is browned and the apples are tender, 15 to 20 minutes. While raw apples are delicious, baking them gives them a mellow sweetness that makes a perfect snack, side dish, or dessert. 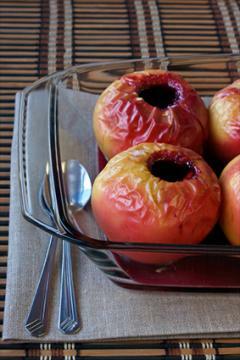 The above recipes are a wonderful way to serve your family apples.